Debate: Did Jesus Claim to Be God? 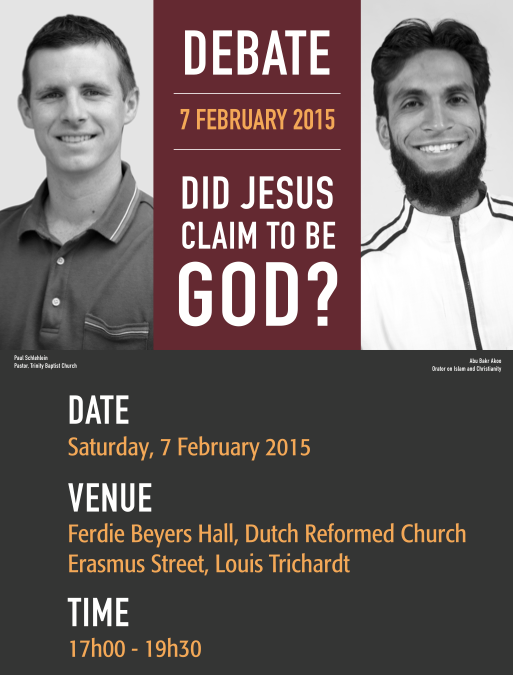 This Saturday I will be debating Muslim maulana Abu Bakr Akoo on the topic: Did Jesus Claim to Be God? My opponent, who is also a friend, wanted to call this event an “Interfaith Dialogue” but I pushed for “Debate”. Dialogue is what two people do when they’re not sure where they stand. Debate is between two people with convictions. I am asking for your prayers. The debate is 7 February, from 5:00-7:30 pm (09:00 – 12:30 Central Time). This is the first debate of its kind in the Limpopo Province of South Africa. The positive vibe and chatter throughout the town in recent weeks has been equalized by others who have written in to the local newspaper encouraging people not to attend. Columns like that only end up bringing more people out. The debate will be recorded on video and posted on YouTube some time later. I will post my opening statement on Saturday. This entry was posted in Apologetics and tagged Islam by Paul Schlehlein. Bookmark the permalink. Praying for a clear mind and the Lord to use this debate for His glory. Looking forward to watching the video on Youtube when it gets up. I am standing in prayer with you Paul. God’s perfect will, now and forever! May God prosper your ways by exalting His Son!